At the beginning of 2018 I decided to offer all my digital thangkas for free and try to live from donations and patronage. Now you can download them all from this gallery page. While you're enjoying or downloading my thangkas, please read my blog on how you can get involved in Digital Thangka painting. You can become my patron and help me with a monthly recurring donation or do a one-time donation through paypal. I am in need of some support urgently. My images are drawn on an A1-size in high resolution (300dpi); the format of the image is .jpg. 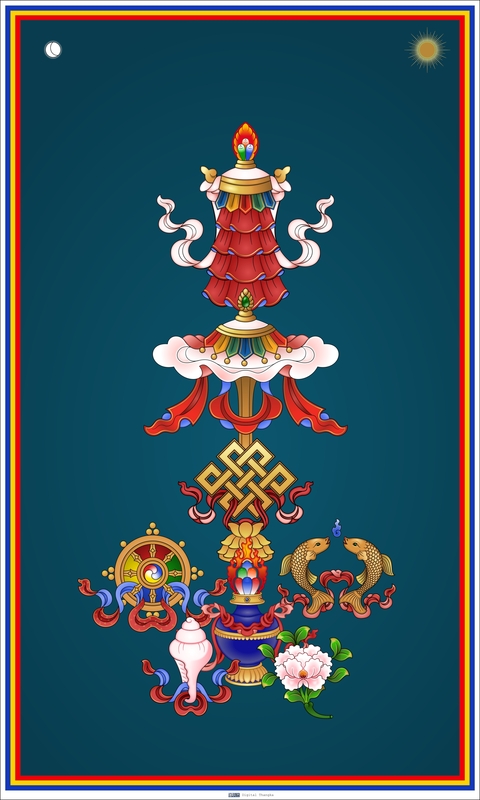 You can download a thangka image of your liking and use it freely: print it, use it on your website, you can even sell prints from it (donations and a reference to me are welcome in this case). There are only two conditions. First, these are Buddhist images, treat them with respect please. Second is a restriction on their use: do not change an image in any way, such as adding other imagery or text, crop them (meaning you cannot cut off parts of it) or change its colours. If you need another version of an image, please contact me so we can work out the details. Some of the images come in different versions, including black&white line drawings. Clicking a thumbnail will open a popup window with all variations, including the download links. Tower of the Eight Medicine Buddhas. 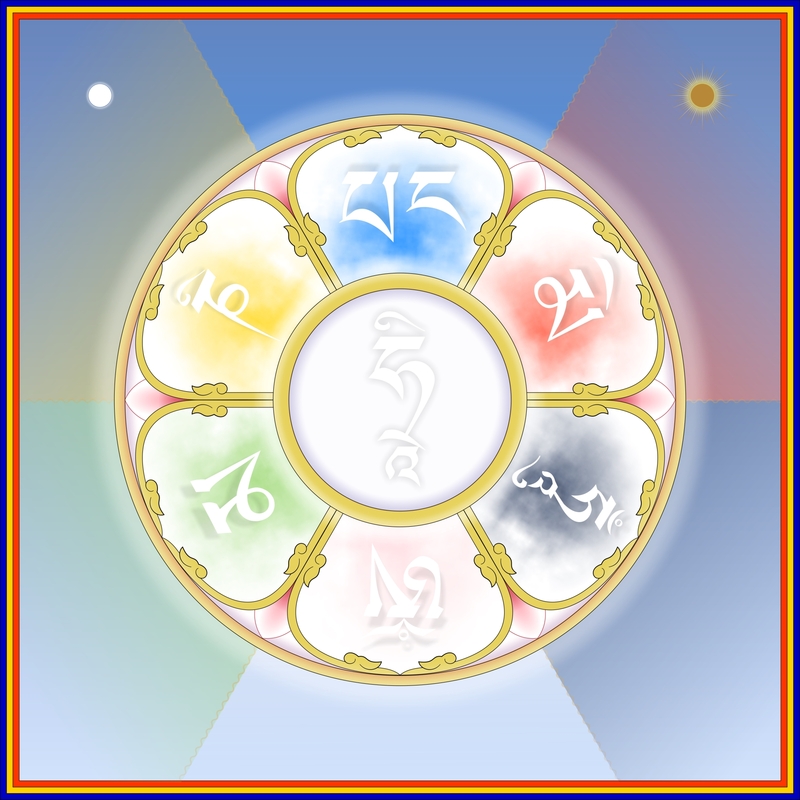 These are the Seven Medicine Buddhas with Buddha Shakyamuni as the eighth. In the middle the Medicine Buddha (Sangye Menla in Tibetan) is depicted. At the bottom of the first image six herbs are drawn, used in Tibetan medicine, from left to right: cardamon, wolfberry, nutmeg, namgyal arura, medicinal ginger and eaglewood. The second one shows the three Long-life Deities, from left to right: White Tara, Amitayus and Namgyalma (Ushnisha Vijaya in Sanskrit. 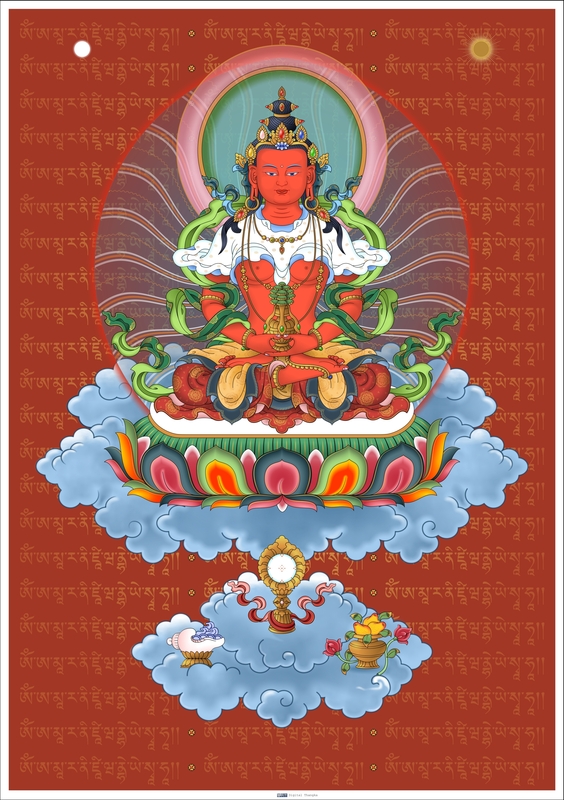 The first version of this thangka is based on the description, given in the 2013 version of the Medicine Buddha sadhana by Ngawang Losang Tenpa Gyältsän, translated by Lama Thubten Zopa Rinpoche and prepared by Ven. Thubten Gyatso. Therefore it is usable in visualization practices. The second one is drawn according to a description, given by the 13th Dalali Lama to the library of the Ganden monastery in Ulaanbataar, Mongolia. At the bottom there are six herbs used in Tibetan medicine, from left to right: cardamon, wolfberry, nutmeg, namgyal arura, medicinal ginger and eaglewood. Green Tara is a bodhisattva associated with compassion and action. 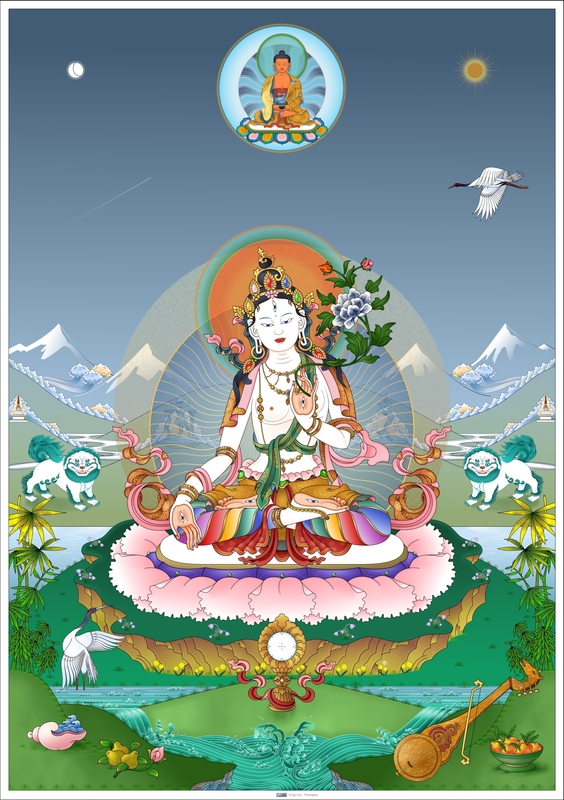 She is seen as the female aspect of Chenrezig (Avalokiteshvara in Sanskrit). It is said that she came into this world from one of his tears. She actively protects against the Eight Fears, hence her wide open eyes as well as the posture of her legs, getting up to leave her lotus throne. This particular thangka is dedicated to Centre de meditació Tushita, who gave me refuge when I needed it most. You can see the buildings of the centre in the hills. The yellow flowers are local to the area; they are called Spanish broom (Spartium Junceum). The last version is meant for people who want to vizualize the deity without being distracted by dakinis and landscape elements. The commissioned image was printed as a giclée print, sized 1,5 x 2,2 m and then sewn into brocade, resulting in a 2.5 x 3.5 meter thangka. You can view the printing and assembling process at my Facebook workshop. Manjushri is a bodhisattva associated with prajñā (transcendent wisdom). He belongs to the three protective bodhisattvas surrounding the Buddha. Manjushri manifests all the Buddha's wisdom, Avalokiteśvara all the Buddha's immense compassion, and Vajrapāni all the Buddha's power. The veera (lute) displayed is a reference to Manjushri's consort Saraswati. She is often depicted playing one, while riding a swan, hence the swan's head at the top of the lute. Prajnaparamita means "The Perfection of (Transcendent) Wisdom", refering to the perfected way of seeing the nature of reality, as well as a collection of suttras. This female bodhisattva with the same name is the personification of this fundamental element of the Bodhisattva path. This image is part of the Mandala of the Medicine Buddha, a painting project I am working on for the next two years. The bodhisattva Vajrapani is the protector and guide of Buddha Shakyamuni and symbolizes the Buddha's power. Vajrapani is extensively represented in Buddhist iconography as one of the earliest three protective deities or bodhisattvas surrounding the Buddha. 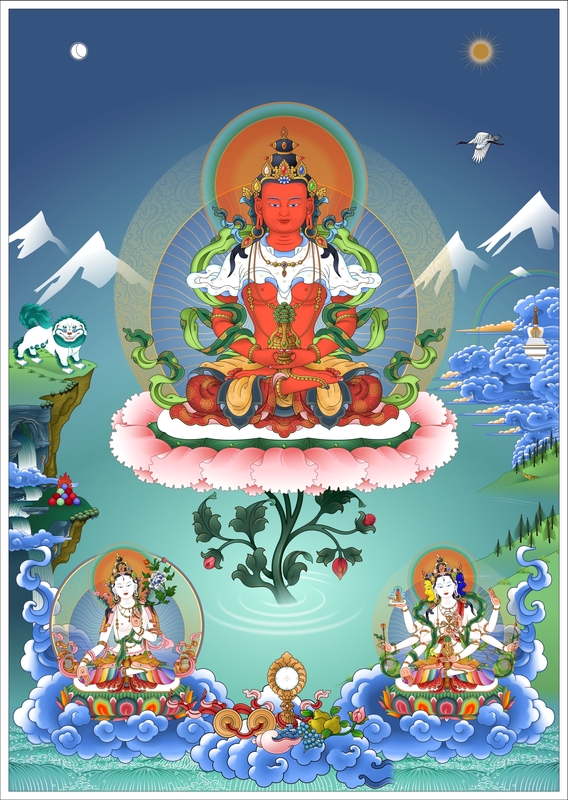 Each of them symbolizes one of the Buddha's virtues: Manjushri manifests all the Buddha's wisdom, Avalokiteshvara manifests all the Buddha's immense compassion, and Vajrapāni protects the Buddha and manifests all the Buddha's power as well as the power of all five tathagatas. For the yogi, he is a means of accomplishing fierce determination and symbolizes unrelenting effectiveness in the conquest of negativity. He is called the Master of Unfathomable Mysteries who upholds truth even in adversities of darkness and ignorance. He is the protector of the Nagas. 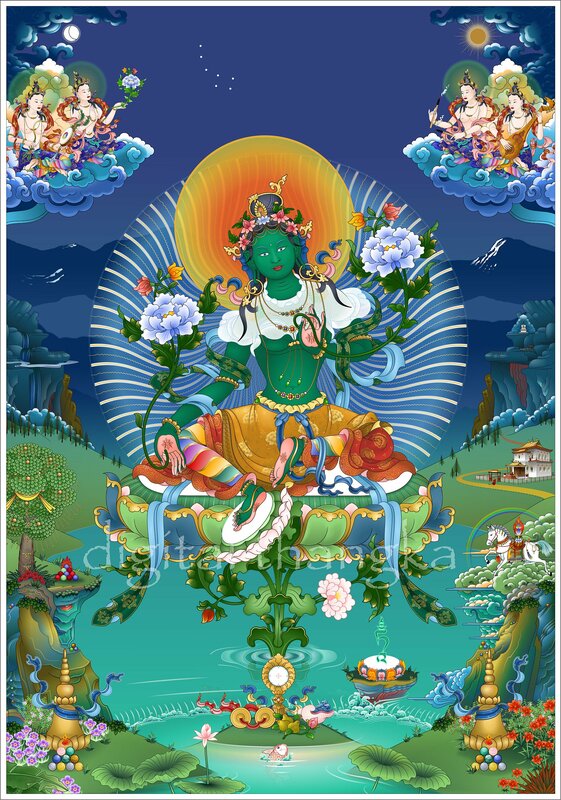 Since the Naga are believed to control the rainclouds, Vajrapani is looked upon as the Rain god, and it is to him the Mahayana Buddhists appeal when rain is needed or is too abundant. His mantra is: Om Vajrapani Hum. Avalokiteshvara (Tibetan: Chenrezig) is the bodhisattva of compassion. His name means "The one with the unwavering eye". His mantra is probably the most well known in the world: Om Mani Padme Hum. Avalokiteshvara wears a deer skin, a reference to compassion. The story behind this is the following. It is said that a certain Tibetan deer is so compassionate, that it cannot stand violence and injustice. Hunters take advantage of its nature to lure the deer out. By staging a fight between two of them, the deer - filled with compassion - comes out of hiding to stop the fighting and then is shot by a third hunter. In this image, compassion prevails: the hunter breaks his bow and befriends the deer. The two fighting men are off to a monastery, one becoming a Buddhist monk. A complete thangka of this image was offered as a gift to HH the Dalai Lama, during his visit to The Netherlands in 2014. 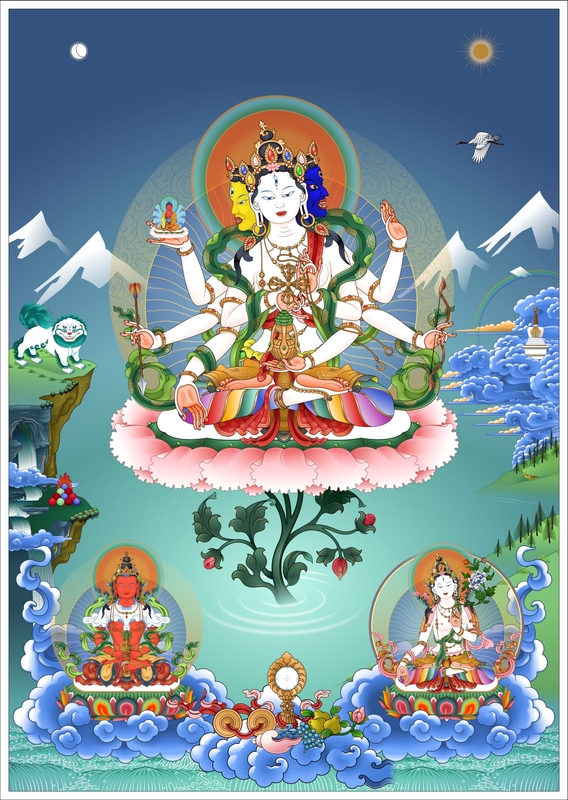 Namgyalma (Sanskrit: Ushnisha Vijaya) is one of the three long-life deities, that are combined in this image; Amitayus sits to her right and White Tara to her left. 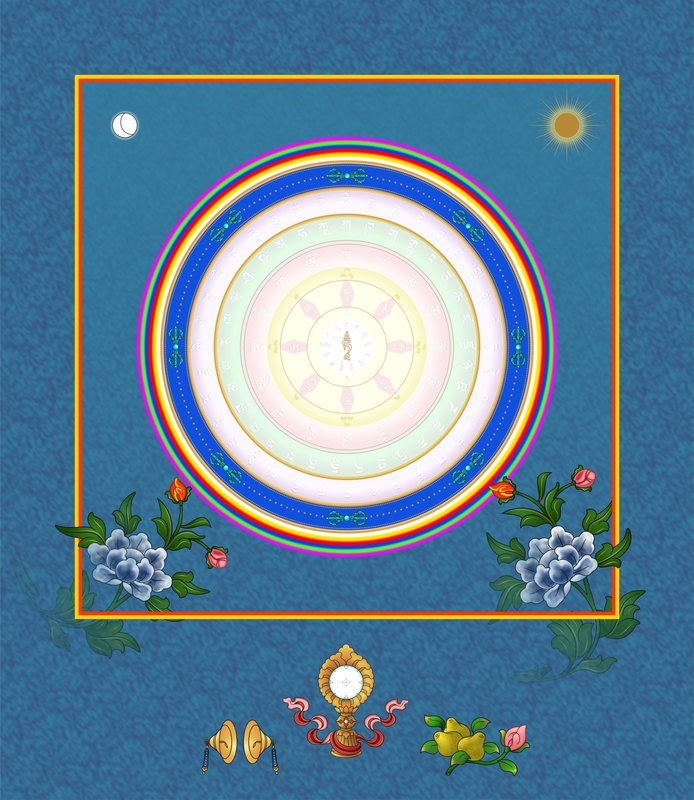 I have made two other variations with each having a different center figure: one with Amitayus in the middle and one with White Tara. White Tara, the female bodhisattva of compassion, long life, healing and serenity; also known as The Wish-fulfilling Wheel, or Cintachakra. The second image of White Tara is a digital translation of a Chinese style, where gold is painted on a dark red lacquer background. As it is customary, I have painted in the eyes and face in full colour. The lotus flower is painted using faded colours. 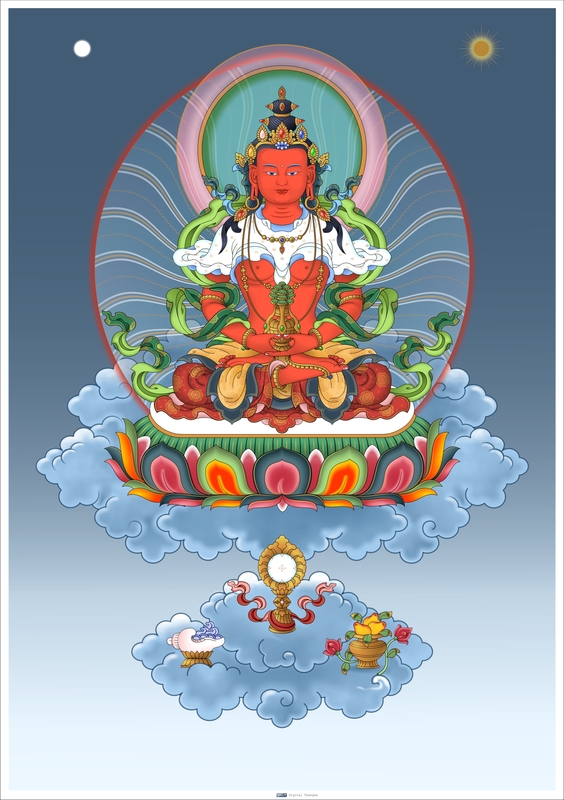 This image of the Medicine Buddha with Healing dakinis was done, according to a visualization description from Healing Buddha – A practice for the prevention and healing of disease and The Prayer Liberating Shakya from disease – © 2001, 2008, Lama Zopa Rinpoche. At dawn or at another time, visualize your ordinary body. In the centre of your chest is your heart, upside down, pointing upwards. Inside your heart is an eight-petalled lotus. In the centre of this is a moon disc, and on that is Medicine Buddha. His holy body, clear and in the nature of deep blue light, is in the aspect of supreme transformation. He is holding an arura plant in his right hand and a begging bowl in his left. 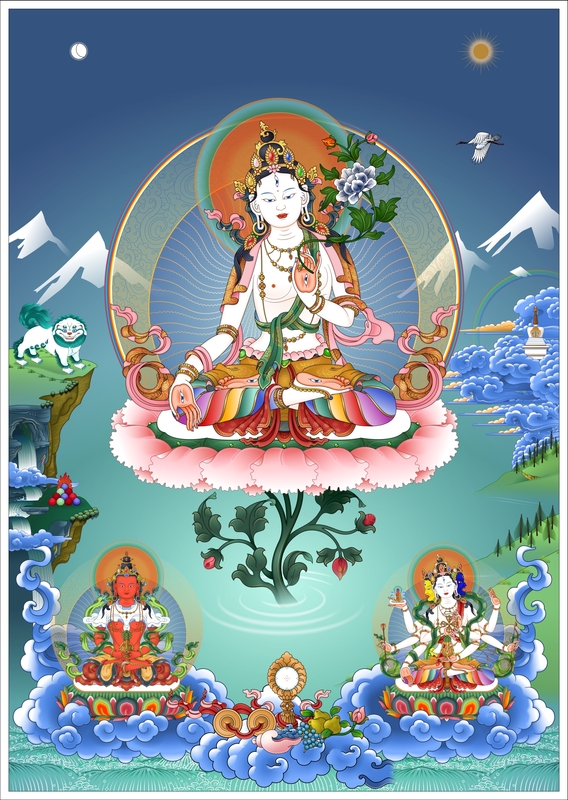 In front of Healing Buddha is the white medicinal goddess, Actualized Wisdom; to his right, the yellow medicinal goddess, Simultaneous Wealth; behind him, the red forest goddess, Neck of Peacock; to his left, the green tree goddess, Having Radiance. Each of the goddesses is in the nature of blissful radiant light and has one face and two arms. In her right hand, each goddess holds an arura plant, and in her left, a vase adorned with various ornaments. Each is seated cross-legged (not in full vajra position) in an attitude of respecting Healing Buddha. From the five deities in your heart, light beams ere emitted in their respective colours. Your whole heart and body are filled with these blissful light beams, which completely purify all disease, spirit harms, negative actions and their imprints. From all pores of your body, five-coloured light beams are emitted. Also, nectar flows down form the begging bowl and the vases held in the left hands of the five heart deities, completely filling your heart and body. From Jan 22-25, 2016, I attended a thangka painting course from my teacher Andy Weber. The subject was Lama Tsongkhapa, the founder of the Geluk school of Tibetan Buddhism and author of the Lamrim Chenmo. Lama Tsongkhapa is accompanied by his two disciples Gyaltsab Je (the older) and Khedrub Je (the younger). I am currently working on a highly detailed Mandala of the Medicine Buddha, with 53 separate images. The second ring of petals from this Mandala is filled with the 16 bodhisattvas. These images are only available in this format to the suporters of my kickstarter campaign Painting the Mandala of the Medicine Buddha. The Eight Auspicious Symbols embody various Buddhist aspects. Amitayus, the sambhogakāya (enlightment) body of Amitabha. Amitabha - also called "The Buddha of Immeasurable Life and Light – also called "The Buddha of Immeasurable Life and Light – is the buddha of longevity. This mantra garland of White Tara contains the short and long mantras, the characters of the Tibetan alphabet, and is surrounded by protective auras. Painting the image was quite challenging, since I wanted to use white characters on a light background. I alo drew a line drawing of the garland. The mantra garland shown is a study in applying aquarel-like painting techniques. This Mandala of the Medicine Buddha is a work in progress. In the middle the Medicine Buddha resides on a lotus throne. On each lotus petal surrounding the main figure various other Medicine Buddhas, Bodhisattvas, Generals, Protectors and additional figures. I ran a crowdfunding project to be able to draw this mandala on a full-time basis, using the funds to start a Digital Thangka Art School and Foundation as well. Currently you can support the drawing of this Mandala through my patreon page. There is too much to explain about this image. My thangka teacher Andy Weber is making a new book about the Wheel of Life, just buy it when it is finished 🙂 Work in progress. The buddha of our time: Buddha Shakyamuni. These are the 21 emanations of the bodhisattva Tara. Work in progress. Padmasambhava or Guru Rinpoche. Work in Progress.